TICKETS ON SALE STARTING NOVEMBER 24 AT TICKETMASTER.COM .PRESALES FOR THE SECOND SHOW IN NEW YORK WILL BEGIN WEDNESDAY, NOVEMBER 22nd USING CODE: MEGA. TUNE IN TO MEGA 97.9FM IN NEW YORK, MEGA 96.3FM IN LOS ANGELES & EL ZOL 106.7FM IN MIAMI FOR YOUR CHANCE TO WIN TICKETS. Miami, FL. (November 22, 2017)—Today, Latin pop sensation and bachata superstar Romeo Santos announced the full routing and ticket information after previously teasing his 2018 “Golden Tour.” The 18-date tour will cross North America kicking off February 15 in New York, NY and wrap in Oakland, CA on April 6. The tour will also make stops in Chicago, Miami, Atlanta, Houston, Los Angeles and more. Spanish Broadcasting System, Inc. (SBS) has teamed up with Romeo Santos and Felix Cabrera Presents on the promotion in key major markets Los Angeles, Miami and New York for the presales. 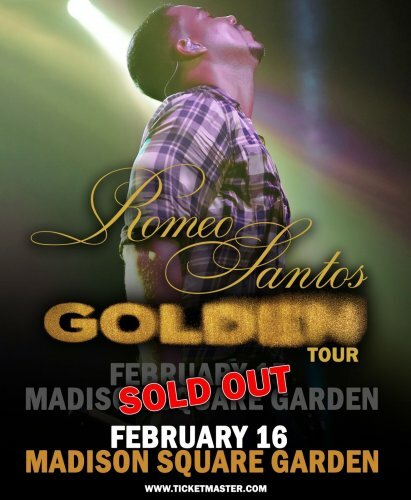 Romeo Santos sold out his first show in a few hours and announced in the Big Apple that his second show is already on sale at the emblematic Madison Square Garden Arena on February 16, 2018. Tickets will be on sale to the general public starting November 24 at 10am local time at www.ticketmaster.com. Exclusive VIP Packages for the “Golden Tour” will also be available to purchase at VIPNation.com. His latest single “Bella y Sensual” featuring Daddy Yankee and Nicky Jam is currently in the top 20 on Billboard’s Hot Latin Song chart. The music video will premiere on November 24th across platforms. The global superstar, singer, songwriter, mogul, actor, and producer rose from humble beginnings in the Bronx, NY to worldwide renown over the course of his unbelievable career. “The King of Bachata” fueled the success of Aventura as chief producer and songwriter before going solo. In addition to selling over 100 million singles and 40 million albums, he has won a stunning 17 Billboard Latin Music Awards, 9 Premios Lo Nuestro Awards, 6 ASCAP Awards, 5 Premios Juventud Awards, 3 Billboard Music Awards, 2 Latin American Music Awards, 1 BMI Award, and 1 MTV Award. Throughout the past decade, the likes of Drake, Usher, Enrique Iglesias, Pitbull, Lil Wayne, and more have all jumped at the chance to collaborate with him. An accomplished visionary, he also acts as CEO of Roc Nation Latino in addition to appearing in films such as Furious 7 and Angry Birds. No other Latin artist has achieved as many number ones in the 21st century. Tune in to Mega 97.9FM in New York, Mega 96.3FM in Los Angeles and El Zol 106.7FM in Miami for your chance to win tickets.